Among the huge number of folders with audio files to find a desired album or song on the computer is not always easy. It often happens that the music files don't have the necessary attributes by which programs - media players organize the music in your library, and this is the key to restoring the full "music" of the order on the computer. If the computer has accumulated a few dozen gigabytes of music, get ready for some serious and long work, but if you are just beginning to build your library, and be finished by you faster. Start by sorting the available songs in separate folders. It may be albums, artists, collections by genre or theme. Having finished that task, move on to the next step. Search the Internet for album covers and collections. It can be as official images, and any images of your choice. But don't forget that these are covers you then will be guided in their music library, so the picture should be informative, or you have her put the relevant text in any available graphic editor. The next stage, you will need an ID3 tag editor for MP3 files. With this program you can "sew" in a musical composition each individual folder your artwork and add descriptions for files that the media player will sort them in your library. Use the program Mp3Tag, which can be downloaded free on the official website at www.mp3tag.de. Run the application after installation, drag the first folder, select all the files, add album art and fill in the field "album Artist" and "album Name" for all. Other fields can be left unchanged, not to spend on the job too long. Click "Save" and proceed to a different folder. Do the same for all music folders. After editing ID3 tags, you will actually get ready the music library. And so it was convenient to search for music and play the songs and albums you need any advanced media player, such as iTunes from Apple. Download this program at official website at www.apple.com and run it on your computer. Drag all folders into the "Music" section and you will see how your music collection is developing into a comfortable and beautiful album list. 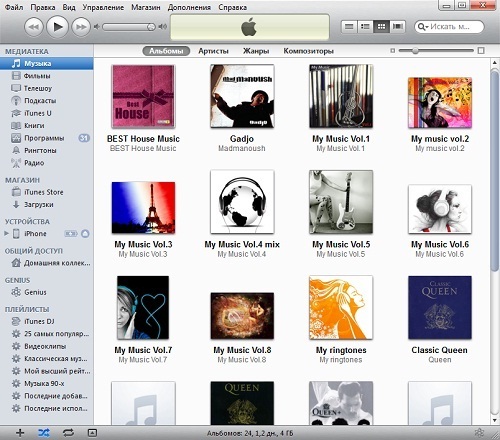 In iTunes you can change the view of your music collection, quickly find any song or artist and play. Now your music will be fine!